Choose a VPN iPhone app and you can browse online with privacy and security, straight from your smartphone. The best VPN for iPhone users will make it simple to pick a remote server and anonymize your online activity. A VPN (Virtual Private Network) can be a great way to get online without location-based restrictions and security concerns. They’ve been around for desktop computers for some time, but if you’re an iPhone user you don’t have to miss out – we’ve rounded up the best iPhone VPN apps to choose. According to research carried out by Stone Temple, 63% of all website traffic comes from mobile devices. It’s just as important to be security-conscious when you’re on the move, however. The good news is that there is no shortage of VPN apps for your iOS device, so you can browse in safety and access a VPN server with your Apple phone or iPad. So what are the best VPNs for iPhone? It’s a competitive market, but based on our expert testing, we’ve identified the VPNs that stand out. How do VPNs work on an iPhone? How much do VPNs for iPhones cost? These are Tech.co’s top picks of the best VPN iPhone apps you can choose. The VPNs below passed our expert, independent reviews with flying colors. All of the above VPNs charge just a small monthly fee of a couple of dollars. For that, you get top features, a range of servers to choose from, and strong speeds while you’re connected to a VPN. As well as subscription based apps, there are also a range of free alternatives. However, we think it’s worth paying a few bucks a month for peace of mind rather than taking a chance on these. Read on to find out more. If you’re after a VPN you can use with ease on your iPhone, then we’ve picked out the best VPN apps below. Our top-rated VPN services are PureVPN, NordVPN and IPVanish. Each of these have fantastic features and strong privacy assurance. We base our ratings on independent tests and quality assessments. As well as rating the features and ease of use of each VPN, we do real-world speed tests using both local and international servers. Remember, you can usually bag a VPN at a discount – be sure to click for deals, below. One of the things we like most about PureVPN is how refreshingly easy to use it is. Setup and day-to-day use feel entirely natural, thanks to an intuitive interface that offers plenty of options, but doesn’t confuse. You can use a PureVPN account across five devices. If you have it installed on your iPhone and desktop, you can still log into another three computers, phones or tablets. The PureVPN lets you control which sites and services you want to use the VPN for, via a method called split-tunnelling. Suppose you want to access one website through a VPN and another through your regular connection. This is simple to set up in the apps options. 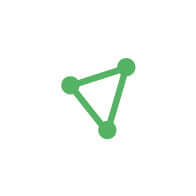 PureVPN is very security savvy, and has features that offer antivirus and ad-blocking. It’s perfect if you want to use PayPal for example, and are concerned about using the unsecured Wi-Fi of a public hotspot. It also passed the Netflix detection test, effortlessly accessing it through the browser and streaming video, hitch-free. NordVPN is one of the best VPN packages we’ve tested. It might be a little too feature-rich for the novice user, but for those who like full control. NordVPN is fast, and can maintain speeds at an impressive rate, beating many of its competitors. There is always some small loss of speed when using a VPN, but with NordVPN, it’s minimal. A suite of extra security features mean that NordVPN is an excellent choice for those looking to protect their data. On the App store, IPVanish pitches itself as the ‘fastest VPN’. While it’s a bold claim, we can say from our own testing that it is certainly one of the quickest we’ve used. It also has a healthy number of VPN servers – over 1,000 in 60 countries at time of writing, so there shouldn’t be any issues getting connected. If you’re looking to mask your IP address, you won’t find many better options than IPVanish. Using lots of devices in your household? An IPVanish account let’s you connect 10 devices to the VPN at once. However, IPVanish is better for the technically minded than novices to using a VPN. While it does offer a lot of flexibility for those who like to tinker with settings, it could be confusing for total beginners. While the monthly cost of $10 is fairly typical, the annual cost of $77.99 is more expensive than other offerings. However, you can get a discount when signing up to IPVanish. Torguard is best suited to those who know their way around a VPN. But anyone with some degree of experience will find a lot to like with the Torguard app. There’s not shortage of VPN servers – over 3,000, based in 55 countries. Not only that, but we found that Torguard maintains great connections speeds when in use, so you won’t be compromising your broadband speed. One pitfall of many VPNs is Netflix spotting that you’re using one. The video streaming giant doesn’t take too kindly to VPNs accessing its service. A lot of big name apps fail penetrate Netflix’s defences. Torguard, however, which can access Netflix with ease. It can also access Hulu, making this a great VPN to choose for streaming services. Private Internet Access gets its balance of cost and features just right, offering plenty of options but without a hefty price tag. As its name suggests, this VPN is designed to offer you a robust and safe connection to the internet that won’t compromise your personal data, and it excels at this. Private Internet Access isn’t the best choice for new starters, but if you’re experienced with VPNs, you’ll get on fine. It doesn’t quite have the speed of some of its competitors, but it does offer solid, good value privacy and anonymity when you’re online. In our testing we found Windscribe to be a super-secure. In our tests, we were unable to spy on the location or even timezone of the Windscribe connection, which is just what you want when you’re after a discreet and safe VPN. Some are easy to circumvent, but not so Windscribe. Unlike some other VPNs on our list, Windscribe has an ace up its sleeve in terms of unlocking Netflix – it can actually do it. The video streaming giant is canny about users accessing its content from different regions, but Windscribe can get you access to the whole library from overseas. Windscribe has an impressive suite of features, as well as being fast and affordable. Some of the more advanced features put it a little out of reach of beginners, but for everyone else it’s a great choice. ProtonVPN has a great set of advanced features that separate it from other VPNs. These include the ability to create profiles for different online activities, server type and the location you want to use them from. There’s also more standard, but no less important features, like a Killswitch, which will halt all your online activity if your VPN fails. This isn’t the VPN to go for if you want something simple and easy-to-use. We think ProtonVPN is excellent for confident users, who will no doubt enjoy the rich features. VPN first timers may prefer something a little less detailed, however. A service such as PureVPN may be preferable for beginners, thanks to its easily labelled modes for usage scenarios. A great VPN for more advanced users, although a it gets a little pricey outside the basic tier. No, HideMe isn’t the fastest VPN out there, but its main strength is that it’s beautifully simple. It’s easy to set up, and boasts an intuitive, well designed app that won’t leave you scratching your head. This makes it a great choice for those new to the world of VPNs. HideMe is a secure VPN, that emerged from our harsh privacy testing unscathed, without revealing information such as IP or DNS address leaks, meaning you can go online with confidence that you won’t be snooped on. HideMe is a good VPN, but we found it to be a little on the pricey side. We really like the straightforward interface and no-logging policy, but we think that PureVPN is a better bet for those who want an easy to use, but comprehensive, VPN. AirVPN prides itself on securing your data, with a level of encryption that actually outdoes that of military standards. Couple this with its strict policies about not logging your data or monitoring your activities, and it’s a VPN that you can feel relaxed about using. This VPN is fast too, netting speeds that are impressive for both short distance servers as well as those overseas. It’s worth noting that there’s no official app for AirVPN, but iOS users can download the OpenVPN app and configure it themselves. Again, this isn’t a VPN for beginners. AirVPN knows its audience – and that’s people with some familiarity with VPNs. Provided you know what you’re doing, it’s a good VPN where privacy and freedom are the obvious priorities. Express VPN has a strong set of features and a slick interface, making it easy to use and a powerful tool. The range of features is excellent, and there are a long list of servers available to connect to. You’re not just limited to Express VPN’s suggestions either – you can manually connect to your preferred servers instead. A killswitch function means that if the connection is lost, you won’t automatically connect to your ISP, meaning that your online activities remain safe. Using a VPN on your iPhone is a simple process. Download the dedicated app from the App Store. You can then create an account in the app, or separately in a web browser. Log in, and you’re away. 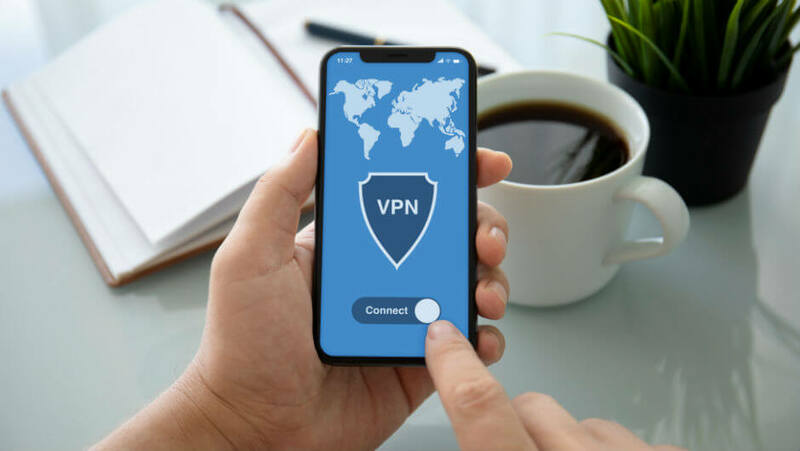 You’ll need to manage the VPN settings within the app, including the location that you want to access the internet from, but these options tend to be well signposted. That’s generally true of all the three apps we’ve covered here, though PureVPN is hands-down the most user-friendly. Once you’ve turned on the VPN in the app, you’ll be able to use your iPhone online, safe in the knowledge that your web browsing is secure and private. This applies to not only using Safari (or your browser of choice), but any apps that you are using which rely on an online connection. One neat feature of using a VPN on an iPhone is that you’ll always know when you’re using the app thanks to the dedicated icon at top of the screen. If that disappears, your connection is no longer being tunnelled through a VPN server. VPN apps are surprisingly inexpensive, especially if you sign up for an annual subscription. The longer you commit to, the bigger the discounts. Pay monthly, and the fee can be less appealing (around $10 per month). Pay for a year or two, and this drops to around $2-$3 per month. Given the competition in the VPN market, companies are falling over themselves to offer enticing rate for customers. But don’t assume the cheapest (or free VPNs) are always the best. The smartest thing you can do is pick a good deal on a well-rated service. PureVPN for example, is our top-rated VPN, and it costs just $2.49 a month if you sign up to its two-year subscription. 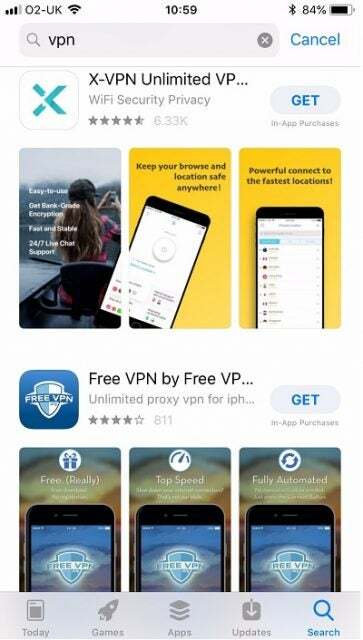 Hop onto the iTunes store, and you’ll see plenty of free VPNs for your iPhone that promise to connect you online and hide your identity. It’s a tempting proposition, but should you be using one and saving your cash? There’s an old adage that if a product is free, then you’re the product. That’s no truer than with VPNs. Paid-for packages make a big deal about the fact that your data is secure and private, and won’t be shared. VPNs know that their customers value their privacy above all else, and don’t want to compromise that. However, with free VPNs, there’s a trade off, especially when you consider the high cost of running VPN servers. The data that the customers of free apps funnel through the servers are highly valuable to third-parties, and can be sold on (typically anonymized) to help fund the app. Others, such as the well-known Hola, will hijack your bandwith and use it for peer- to-peer connections. It’s always worth checking the terms to see exactly how secure your personal data is and what rights you’re signing away when you install them. Not all free VPNs are sketchy, however. The most important thing is to pick one you can trust – see our guide to the Best Free VPNs to choose for more.